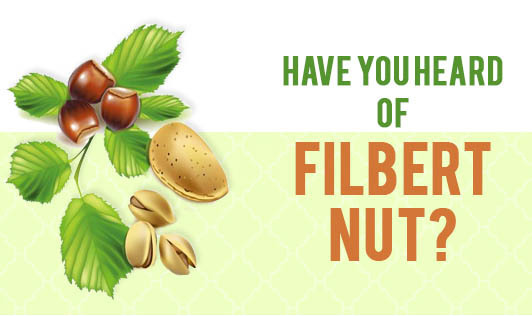 Have you heard of filbert nut? Filbert nut also known as hazelnut or cobnut is known to have many health benefits such as reducing depression, preventing cardiovascular diseases, and avoiding urinary tract infections. The nut falls out of the husk when ripe, the kernel of the seed is edible. Fiber nut can be used raw or roasted, or can be ground into a paste. Hazel nut is rich in calories, 628 kcal/100 g. It keeps you fuller for longer and is also great for a person aiming for healthy weight gain. Hazelnut is rich in folate which helps in reducing the risk of neural tube birth defects. It is good for pregnant woman. It is rich in potassium and may help in reducing the risk of cardiovascular disease and helps in treating depression. Hazelnut is high in copper, more than 90% of the daily requirement is present in this nut. Copper is needed for iron absorption and improves hemoglobin level. Around 150g of hazelnuts contains 80% of the recommended daily allowance of vitamin E. Vitamin E has been proven to protect skin from the harmful effects of ultraviolet radiation, such as skin cancer, and premature aging. Hazelnut is rich in other nutrients such as proteins that is about 14.95 g/100 g and unsaturated fats. As mentioned these nuts provide great health benefits. Include them in your daily diet to reap their benefits.